Lacrimal glands are exclusive structures possessing both epithelial and lymphoid tissue and may produce a variable range of pathologies such as neoplastic, infective, infiltrative, inflammatory and structural. Treatment is either anti-inflammatory in the form of corticosteroids, radiotherapy or complete excision in the field of modern medicine. A female patient named IB, aged 35 years, came with bilateral firm swelling of the lacrimal gland. She started treatment under modern medicine doctors; however, when she was advised for biopsy, for histopathological examination, she preferred to go for Homoeopathy. The swelling was developing gradually for 2 months – painless, no fluctuation, no fixity to skin and underlying structures. After thorough case-taking followed by repertorisation, Calcarea carbonica 1M, two doses were prescribed. The patient reported after 2 months with zero Outcome in Relation to Impact on Daily Living instrument score. Further modification was done in repertorisation, and now Silicea 1M, two doses was prescribed. Treatment continued for 4 more months and no new medicine or further repetition was required. Documentation was done in the form of photographs of the patient from the same angle under similar light exposure in every follow-up. Lacrimal gland tumours represent only 10% of all space-occupying orbital lesions. They are generally divided into two broad categories: epithelial and non-epithelial. Inflammatory lesions and lymphoproliferative lesions are a common variety of non-epithelial lesions. In the epithelial category, it is either a benign growth (pleomorphic adenoma) or malignant growth (adenoid cystic carcinoma). Characteristics of the particular lesion, duration of symptoms, presence of pain and radiologic findings are the major focusing points in the management. Acute onset of swelling associated with periorbital pain, chemosis and indurated lid indicates an inflammatory lesion. Lacrimal gland inflammation results in insufficient secretion, leading to dry eye syndrome. Lymphoproliferative growths are characterised by insidious-onset, painless proptosis and are often bilateral. Pleomorphic adenomas present as painless, progressive proptosis and downward and inward displacement of the globe. A non-tender palpable mass in the superotemporal orbital quadrant is present in most patients. These palpebral lobe tumours are freely movable and do not produce proptosis or bony changes. The most common malignant epithelial tumour of the lacrimal gland is adenoid cystic carcinoma, which presents with a shorter duration of proptosis, globe displacement and characteristic pain due to perineural invasion and may be associated with motility disorder, diplopia, ptosis, lachrymation, numbness and decreased vision. The following case was either having benign, inflammatory or lymphoproliferative growth as there were no destructive and invasive changes such as ptosis, displacements or bony erosions. Of the above characteristics mentioned, the below-mentioned case report is most likely to be lymphoproliferative, i.e., painless, gradual development and bilateral. A female patient (IB) aged 36 years attended the outpatient department with a complaint of swelling on superolateral side (close to the outer canthus) of the left and right orbital rims of both eyes. The swelling had been developing gradually for the last 2 months. It was a firm painless (occasional pain), no fluctuation, no fixity to skin and underlying structures. The size of the swelling was approximately 15 mm × 10 mm × 15 mm and 20 mm × 10 mm × 15 mm of the left and right orbital rims, respectively. Hot compression was used twice a day although with no results (as per the suggestion of the previous physician who diagnosed the swelling to be chalazion). The only symptom was the absence of tear. 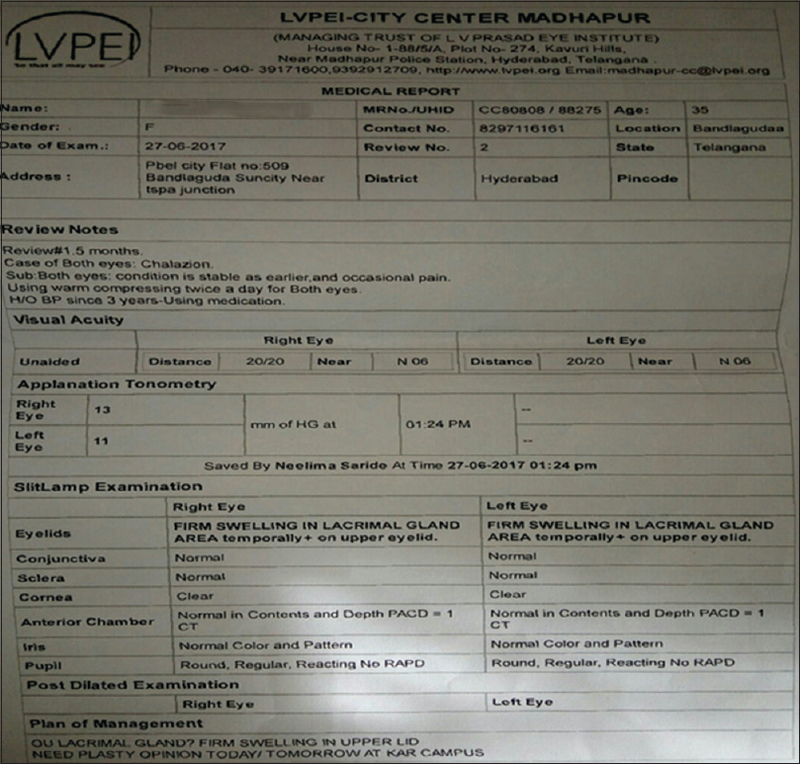 Medical report of slit lamp examination reflected a firm swelling in the lacrimal gland on the upper eyelid of both eyes [Figure 1]. The patient had a history of appendicectomy 10 years ago. There were no post-operative complications. She suffered from Jaundice 14 years back during her college days. No specific medications were used except some liver tonics, and no significant consequences felt after recovery. The patient is a known case of essential hypertension and is under anti-hypertensive allopathic drugs for 3 years. She also had a constant predisposition to get affected by humid conditions. She said that whenever she returns to Kolkata, she develops cough and cold. In addition to this, she had a chronic diathesis of nasal obstruction. Mother is suffering from uric acid diathesis and some kind of hearing impairment. Father is a patient of hypertension for 10 years and is on anti-hypertension drugs. The patient by occupation is a teacher in English-medium school, living with her spouse in Hyderabad who is an Engineer doing his job in a private firm. They had no issue although they are married for >7 years. For this problem, they were under consultation with a fertility clinic 2 years ago, but no result. As per the oral conversation (since they did not bring any reports regarding the infertility clinic and was only concerned with the swelling on the eyelids) with the couple, the patient had polycystic ovary detected in a ultrasonography. The patient by nature was a perfect example of a foodie. She enjoys food with delight. Of many things, she had strong desire for egg and milk. Bowel movements and urination had no significant points of deviations. The patient had an extreme intolerance to the cold (dry and wet) of winter and rainy seasons. She also had tendency of profuse sweating, especially on head and scalp. Menstrual irregularities were marked of which late catamenia was the key. The patient had Endomorph body with obesity (body mass index = 31). Fatty streaks along the flanks on lower abdomen and also around the anterior folds of axilla (both) were observed. Numerous brown spots were visible on the skin. After analysing the symptoms of the case, the characteristic general and particular symptoms were considered for framing the totality. Desire for egg and milk, delayed menses, profuse perspiration on scalp ailments from humid and cold weather, chronic nasal obstruction and swelling on eyelids were included in totality. Miasmatic evaluation of all the presenting symptoms was done which showed the predominance of psoric and sycotic miasm in combination [Table 1]. Considering the above symptomatology, Kent Repertory was preferred, and using HOMPATH software, systemic repertorisation was done. The repertorisation chart is presented in [Figure 2]. After repertorisation, many medicines were competing with each other, namely Calcarea, Silicea, Mercurius and Sulphur, where the maximum number of symptoms was covered by Calcarea (i.e., 7 out of 8) with maximum score. Ultimately, on consultation with Materia Medica, Calcarea 1M, two doses were prescribed in the first visit. The follow ups are given at [Table 2] along with the photographs [Figure 3-11]. The above swelling of the lacrimal gland was considered to be lymphoproliferative as per the clinical features, but the rubric selection during the 2nd repertorisation (in the 2nd visit) was ‘eye–inflammation–lacrimal gland’ replacing the rubric ‘eye–swollen–lids’ during the 1st repertorisation (1st visit). This should not be doubted as an error as literature search from reputed clinical Materia Medicas such as TF Allen's Encyclopedia of pure Materia Medica; Boger Boenninghausen's Characteristics and Repertory and Clark's Dictionary of Materia Medica showed ‘swelling in the region of the right lachrymal gland and lachrymal sac (after six days)’ and ‘swelling of lachrymal gland', respectively, under the drug Silicea. However the term ‘inflammatory’ is found in many books of therapeutics and Materia Medica under other drugs also. Hence, it is understandable that finer discrimination between ‘swelling', ‘inflammatory’ or ‘lymphoproliferative’ (which was not found in proving records) is not possible from our 200-year-old literature. Interpretation of such clinical understanding is just essential for academic purposes. Another point of differentiation is that according to JH Allen – ‘Disturbances in the glandular structures or in the lachrymal apparatus are always syphilitic or tubercular', but in the above-mentioned, the miasmatic analysis of the present symptomatology indicates sycosis on a psoric platform. Finally, it should always be kept in mind that ‘those affections, alterations and ailments appearing on the external parts, which do not arise from any external injury or which have only some slight external wound for their immediate exciting cause, are produced in quite a manner and their sources lies in some internal malady'. The above illustration of lacrimal gland tumour is an example of such an ailment locally appearing over the eyelids and having negligible particular symptoms. These cases can be rightly said as one-sided diseases in which selection of Simillimum is based on the mental and physical generalities along with past and family history. The beauty of Homoeopathy is that it has widespread effectiveness. For example, many a times, certain cases which are expected to be entirely surgical (as per the printed books, journals, articles, etc.) may be annihilated with Homoeopathic medicines and lifestyle modifications only. The outcome of the above-mentioned case clearly proves that proper selection of the Homoeopathic remedy after classical miasmatic and repertorial approach can remove tumours without any surgical intervention, and this can serve as an alternative option. This is definitely cost-effective and may be an alternative for the reasonably under-privileged section of the people, particularly residing in distant areas where medical facilities and infra-structural conveniences for doing surgery are negligible. The authors certify that they have obtained all appropriate patient consent forms. In the form, the patient has given her consent for her images and other clinical information to be reported in the journal. The patient understands that her name and initials will not be published and due efforts will be made to conceal identity, but anonymity cannot be guaranteed. Shields CL, Shields JA, Eagle RC, Rathmell JP. Clinicopathologic review of 142 cases of lacrimal gland lesions. Ophthalmology 1989;96:431-5. Hada M. Ocular Malignancies. Lacrimal Gland Tumor – An Overview. 2014:20(6):29-34. Available from: http://www.dosonline.org. [Last accessed on 2018 Aug 22]. Zoukhri D. Effect of inflammation on lacrimal gland function. Exp Eye Res 2006;82(5):885-98. Vangveeravong S, Katz SE, Rootman J, White V. Tumors arising in the palpebral lobe of the lacrimal gland. Ophthalmology 1996;103(10):1606-12. Patel RP. 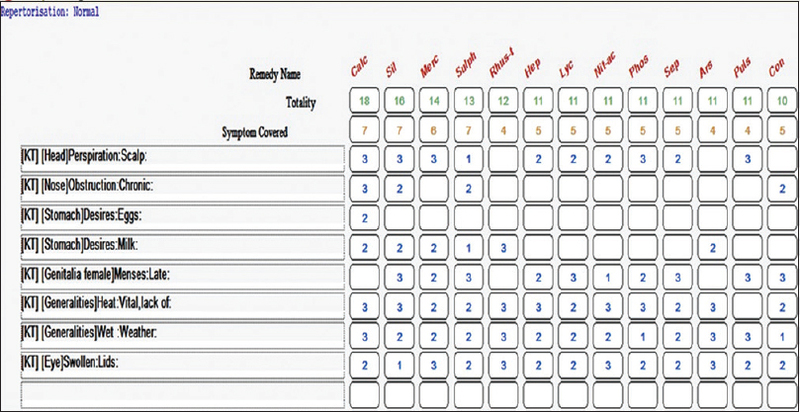 Chronic Miasms in Homoeopathy and Their Cure with Classification of Their Rubrics/Symptoms in Dr. Kent's Repertory. Indian edition. New Delhi: Indian Books and Periodicals Publishers; 1996. Shah J. Hompath Classic-Homeopathic Software. Version. 8.0. Mumbai: Premium; 2005. Reilly D, Mercer SW, Bikker AP, Harrison T. Outcome related to impact on daily living: Preliminary validation of the ORIDL instrument. BMC Health Serv Res 2007;7:139. Tang SX, Lim RP, Al-Dahmash S, Blaydon SM, Cho RI, Choe CH, et al. Bilateral lacrimal gland disease: Clinical features of 97 cases. Ophthalmology 2014;121(10):2040-6. Moffat J. Homoeopathic Therapeutics in Ophthalmology. New Delhi, B Jain Publishers Pvt. Ltd., 1995. Allen JH. The Chronic Miasm. Vol. 1, 2. Low Price edition. New Delhi: B. Jain Publishers (P) Ltd.; 2002. Hahnemann S, Krauss J. Organon of Medicine. Translated by Dudgeon RE, Boericke W. 5th ed., 6th ed. New Delhi: B. Jain Publishers (P) Ltd.; 2010. Chattopadhyay R. A Complete Book on Cardiovascular System for Homoeopaths. 1st ed. New Delhi: B. Jain Publishers (P) Ltd.; 2005. p. 208.